When the call came in from animal control in York County, Pennsylvania, of a large Percheron draft horse caught in a severe neglect situation, the volunteers at Gentle Giants dropped everything to drive to his rescue. The horse was a shell of what he should be. Weighing just 1,000 pounds, he was well below the 2,200-pound healthy weight of a draft horse his size. The volunteers had a decision to make: euthanize him to alleviate his suffering or try to take him back to their 135-acre farm. “He looked like he wasn’t done yet. As thin as he was, he still had a lot of fire in him,” said Dawnn Double, development director at the rescue. On Thursday, she walked up to the barn where some of the rescue’s sickest horses are kept. The white Percheron — now called Tonka — was standing in the far stall. Standing was an improvement. On his sickest days, he lay on the ground and pressure sores opened on his rear hip and ankle and near his front shoulder. Now that he was standing again, a veterinarian could begin to address the damage the neglect had done inside. An extensive blood panel would soon show if Tonka’s organs were damaged by starvation, which is hard to see externally, Double said, even as Tonka’s ribs gave his sides a rippled appearance. Double has volunteered with the rescue for 12 years, and Tonka is the worst case she’s seen in her year as development director. In the past, she has traveled with volunteers to auctions in Pennsylvania, where Gentle Giants Draft Horse Recuse outbids slaughterhouse purchasers for draft horses they believed could be trained and rehabbed. The history of horse slaughter and horse meat sales in the U.S. is long and filled with controversy, as Susanna Forrest wrote for Object Lessons and was published in The Atlantic in June 2017. At times, it has been outright barred, or Congress and the president have defunded U.S. Department of Agriculture equine inspectors, making the slaughter of horses functionally illegal in the U.S. In other countries, however, horse meat remains a delicacy and a lucrative market. At an auction, the rescue raises the bid so it’s no longer economically feasible for the meat buyers to purchase the horse, Double said. 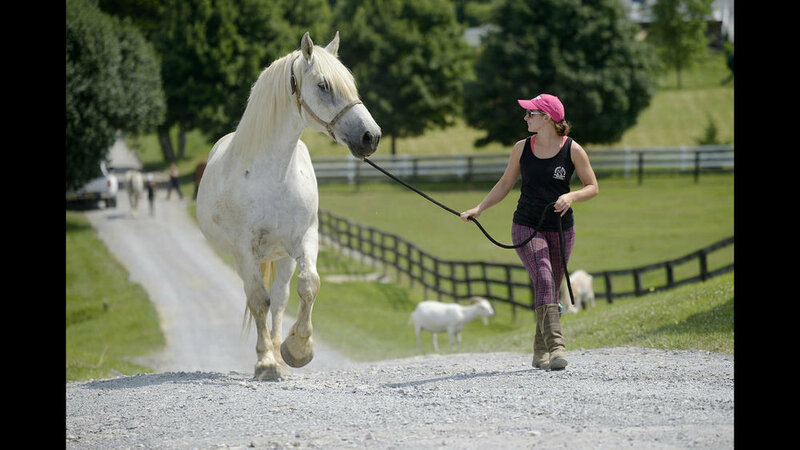 The rescue’s founder and president, Christine Hajek, has been traveling to auctions for years, rescuing draft horses and taking them back to her Mount Airy farm in Howard County. Over the years, she’s learned who are the buyers and who are the families. “If we see a private family ... if it’s a family bidding on a really good horse and they want it as a pet, we’ll back off,” Double explained. Gentle Giants Draft Horse Rescue has about 117 horses in its care. For neglected, abused or lost draft horses, it is one of the few places equipped to care for them. “We would love to save every horse we can, but our main mission is to save [horses] from slaughter or neglect,” Double said. Most will be trained at trail riding horses and rehabbed so that they can be adopted. Shelby Piovoso, 23, is the lead trainer at the stable and picks from the list of horses every day to clean, saddle and work. One of her recent success stories was Kanin — a draft cross — who had been at the farm for nine years, was labeled “dangerous” and believed to be unfit for adoption. “We were kind of sure he would never find someone,” Piovoso said. Then a volunteer named Jim found Kanin and together they worked through Kanin’s extreme fear of people. His adoption is being processed, and Kanin is expected to go home with Jim in August. The rescue’s reputation for care and success stories has made it a resource to animal control agencies in Maryland and Pennsylvania. “They are definitely a go-to rescue for draft resources,” said Frederick County Animal Control Director Linda Shea. Frederick County is lucky to have few loose or neglected draft horses, Shea said. However, the rescue’s good reputation has made Animal Control comfortable using the rescue if a situation should arise, she said. Since 2010, Animal Control has re-homed only one potbelly pig in September 2017 to Gentle Giants, Shea said. An assortment of barn cats, goats, and rams also live on the farm, and founder Hajek is forming a second nonprofit called Gentle Friends Farm and Wildlife Sanctuary for its other residents, Double said. None of it would be possible, however, without the volunteers. Hanna Ruark, 22, has been volunteering at the rescue since she was 12 years old, and she considers the farm her second home and workplace. She will soon go to veterinary school, but she has already learned a lot from hands-on experience. The rescue is known for its work with canker — an inflammation in the hoof wall — that pushes the coffin bone in the ankle through the bottom of the horse’s foot and eats away at the hoof. It can be deadly, but the farm has been working to provide better canker care. Madison, a former New York City carriage horse who developed canker, was re-homed to Gentle Giants, after her bone shifted in her foot and went lame. Her care was hour-by-hour as the staff weighed her pain and improvement to see if they should euthanize her or keep fighting. Madison hung on and today is sound-footed. The volunteers and staff say their farriers — Precision Horseshoeing — deserve the praise. In Madison’s case and Ezekiel’s — a rescued Belgian whose front hoofs are cracked and dissolved up to the fur line — the farriers have designed individual care plans. It may take a year or more for Ezekiel’s hoofs to regrow. The situation could be likened to a bad fingernail injury, except more than half of Ezekiel’s body weight is being held up by it, Piovoso said. The farriers drilled special screws and wires into the hoof to keep it from splitting further, and at night they pack the wound with medication and turn him out to graze. The women were hopeful Ezekiel’s story would turn into a happy one. “I love everything about this place; the peace it brings. I don’t like having to look at the Tonkas, but knowing we’re helping them — levels it out,” Double said. More than a decade ago, Christine Hajek began looking for a draft horse rescue to volunteer at. After searching online, she was shocked to find that not only were there no organizations in the state of Maryland, there were also none in the country. Draft horses are large horses bred to work on farms doing tasks such as plowing and other labor. Hajek began going to auctions and began purchasing some of the best horses that were being sold for slaughter. She’d ride them for a few months, and then after checking buyers out, sell them to a good home. Hajek’s hobby got to the point that there would be four or five horses available to adopt out at any given time, she said, and she had to make a choice. The Gentle Giants Draft Horse Rescue, located at 17250 Old Frederick Road in Mount Airy, was formed in 2005. The original vision was to one day have seven horses at any given time for adoption. As of mid-July, the organization has 119 horses. For Hajek, who is the president and founder of Gentle Giants, it’s more than just a job. As she walks through the 135 acres of land — between barns and pastures — she stops to love each animal. She paused to rub the face of one horse, scratches behind the ears of another. She pets the goats, sheep, cats and other animals that have found their homes at the rescue too. Gentle Giants Draft Horse Rescue in Mount Airy Friday, July 13, 2018. All photos by Dylan Slagle. Trainer Shelby Piovoso leads Avalance, a nearly 30-year-old Persheron gelding, rescued from slaughter, to his training session at Gentle Giants Draft Horse Rescue in Mount Airy Friday, July 13, 2018. Trainer Shelby Piovoso washes Avalance, a nearly 30-year-old Persheron gelding, rescued from slaughter, at Gentle Giants Draft Horse Rescue in Mount Airy Friday, July 13, 2018. Rick Blatchford volunteers at Gentle Giants Draft Horse Rescue in Mount Airy Friday, July 13, 2018. Executive Director Christine Hajek, right, talks with Lauren Bognovitz, left, working with Pandora, a female Haflinger, during a training session at Gentle Giants Draft Horse Rescue in Mount Airy Friday, July 13, 2018. Trainer Shelby Piovoso works with Avalance, a nearly 30-year-old Persheron gelding, rescued from slaughter, during a training session at Gentle Giants Draft Horse Rescue in Mount Airy Friday, July 13, 2018. Lauren Bognovitz works with Pandora, female Haflinger, during a training session at Gentle Giants Draft Horse Rescue in Mount Airy Friday, July 13, 2018. Executive Director Christine Hajek, left, and Director of Development Dawnn Double make their way through the grounds at Gentle Giants Draft Horse Rescue in Mount Airy Friday, July 13, 2018. Director of Development Dawnn Double, left, and Executive Director Christine Hajek look in on Tonka, a male Percheron rescue from York County, Pa. being rehabilitated at Gentle Giants Draft Horse Rescue in Mount Airy Friday, July 13, 2018. Director of Development Dawnn Double comforts Tonka, a male Percheron rescue from York County, Pa. at Gentle Giants Draft Horse Rescue in Mount Airy Friday, July 13, 2018. 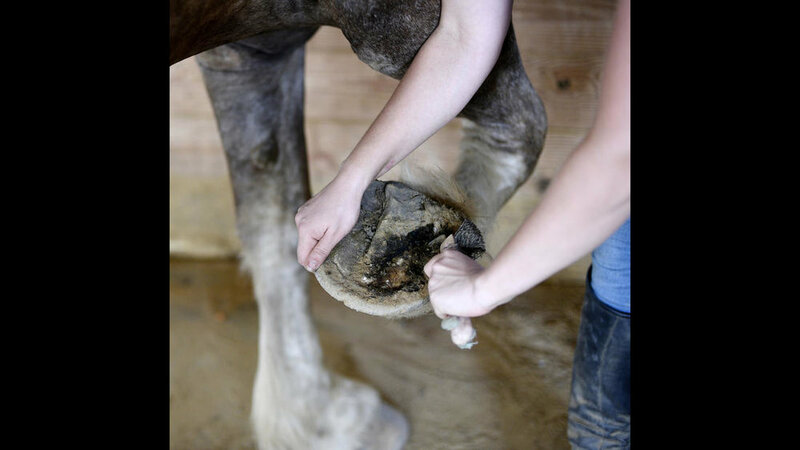 Hanna Ruark cleans the hooves of Grumpy, a female Belgian, before a training session at Gentle Giants Draft Horse Rescue in Mount Airy Friday, July 13, 2018. Since its formation all those years ago, the organization has just grown, Hajek said. The ultimate goal? “We facilitate the rescue of draft and draft cross horses from slaughter, abuse and neglect,” she said. Hajek said the horses they rescue are often coming from the sale auction or are being brought in after having been abused or neglected. But the rescue is just the beginning. Hajek said they attend sales and pay attention to the horses who are being bid on by kill buyers on behalf of the slaughterhouses. Horse meat is considered a delicacy in some countries such as Japan, and draft horses are popular for meat because of their sheer size. On occasion there are some buyers not purchasing a horse for slaughter, she said. What they do is bid against the kill buyers until they stop bidding or they bid the horse past the point of being profitable for them. If someone else is bidding, and they’re bidding past the point of it being profitable for slaughter, they assume the bidder is reputable, she said. When a horse comes in from slaughter, Hajek said, they typically have to work with hoof neglect and retraining. These horses were more often than not plow horses prior to the sale, she added. The issues are different when a horse comes in from animal control, she said. In that case, the problem is usually physical neglect, and the horse goes through a whole process of physical rehabilitation before they can even think about training. “Often with those horses they have a slightly longer process,” Hajek added. If a horse has been surrendered, the problems can be a mix bag, she said, The animal may be slightly neglected, or, she said, sometimes wonderful owners have unfortunate things happen and can’t keep their horse. The first step when a horse comes in is a minimum 21-day quarantine. The horses have often been in very crowded environments if they come from auction — it’s like an airport — with horses from all different areas coming in and out, Hajek said. This means that viruses, bacterial infections and airborne diseases are very common, she added. After the quarantine, horses go into an assessment program to see if they need more rehabilitation or if they can move into training. “We start all of our horses with a reevaluation from the ground up to retrain them for riding if they’re able,” Hajek said, because almost all adopters want to be able to ride the horse. Trainers also work on manners, like if a horse leads politely, is able to let someone pick up it’s feet, if they’ll stand for shots and more. Often, she said, even if horses have had previous careers, they have some gaps in their knowledge. If a horse is too sick, Hajek said they have to instead euthanize the animal. It’s a hard topic, she said. “Of course, it’s sad,” she said. But, sometimes it’s necessary, and the rescue is stepping in — and stepping up — for a horse because someone else has failed to do so, Hajek added. “Our ultimate plan for every horse is for it to find an absolutely loving, perfect adopter that’s just going to cherish them for who they are,” she said. They want to find an adopter who is in it “for the long haul” — it’s more about what the adopter can do for the horse, not what the horse can offer the adopter, she added. Most horses at the rescue find this. But, Hajek said, they don’t give the horses a timeline. There’s a horse that will finally be adopted this summer who has been with the rescue for nine years, she said. Gentle Giants Draft Horse Rescue is 100 percent donation based, Hajek said, and is consists of a number of small donations. While there are 13 full-time barn staff, Hajek said she considers the organization volunteer based. They have 175 active volunteers, but a core group of about 40. And they’re always looking to add more, she said. If someone has farm experience, they may go through two trainings before being set loose. Someone with less training will likely go through four or five trainings. But, from the beginning, everyone is working with horses. “From the first day, you’re feeding horses, you’re walking horse to pasture,” she said. A volunteer works with the animals, mucks stalls and more. The experience is very hands-on, she said. Rick Blatchford is one of those volunteers. He said via email that while he started riding horses at the age of 12, he realized his knowledge of horse health care was lacking. Hajek said if someone can commit to 20 hours a month, they can be involved in a partner program, where a volunteer is paired with a horse and comes in three or four times a week to spend one-on-one time with the animal. “Partner programs are a great way that some of our retired horses that don’t get a lot of attention still feel important,” she said. The horses look forward to having someone special come in and see them, Hajek said, who focuses on meeting the horse’s emotional needs. Its physical needs are always met at the rescue, but that’s not enough. For more information on volunteering, email the volunteer coordinator at volunteers@gentlegiantsdrafthorserescue.org or call 443-285-3835. For more information on Gentle Giants Draft Horse Rescue, visit https://www.gentlegiantsdrafthorserescue.org/.